For those not in the know, Jennifer Saran is a North American alt-pop/adult contemporary artist, songwriter and vocalist based in Hong Kong. 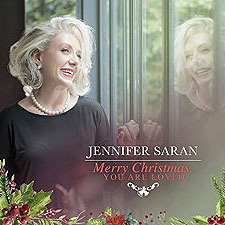 Her first just released full-length album, Merry Christmas, You Are Loved, is now available both digitally and physically worldwide. Indeed, this brand new debut album was created with legendary producer Narada Michael Walden, and has therefore had the added bonus of being released through his very own uber successful label, Tarpan Records. But there's much more to this debut album than landing a legendary producer, and recording 16 Christmas songs, all so that said album can be released on said producers converted record label. You see, as the story goes, since she was a young child, Jennifer has also loved Christmas. So, obviously, when she had the opportunity to work with one of the most lauded producers in modern recorded music, she jumped at the chance to create and release her debut album. And when asked what that album would be, she knew right away: a modern day Christmas album, of course. The album is a contemporary mix of brand new originals penned by Jennifer and Narada, as well as some very well chosen covers, all of which revolve around the central themes of love and family and the winter holidays. Musically, the album spans ballads to up-tempo grooves, including some swing and gospel influences as well. Having now listened to Merry Christmas, You are Loved three times this afternoon alone, I can honestly tell you that it is, quite easily, one of the most delightful Christmas albums that I have ever had the chance to listen to. Indeed, it is a perfect complement to a family holiday dinner, or to the opening of the Blessed morning itself. Narada enlisted some amazing musicians and performers for his band on Merry Christmas, You Are Loved, including: Frank Martin (Angela Bofil, John Handy Band, Tuck & Patti, Jose' Neto, Airto & Flora, Sting & Trudie's Rainforest Band) on Keyboards, Angeline Saris(Gretchen Menn, Zepperella) on Bass and Vocals, Matthew Charles Heulitt (Zigaboo Modaliste) and Jose' Neto on Guitars. Additional Backing Vocals on this album include vocalists Nate Soul Sanger and Cornell Carter and all of the strings were arranged and conducted by Minna Choi of Magik*Magik Orchestra.